The Better Care Reconciliation Act (BCRA) proposes to cap Federal Medicaid reimbursements to the states on a per-enrollee basis, effectively limiting growth to a rate at first only modestly exceeding the rate of inflation in healthcare costs and then falling below inflation. If the BCRA were to be enacted, it is reasonable to assume that most states would limit home and community-based services (HCBS) spending to the per-enrollee cap amount; otherwise, any excess comes entirely out of the state budget. This report uses state-by-state HCBS expenditures from 2001 through 2013 and compares the growth in spending during those years to the limitations that would have been in place had BCRA-like caps been imposed during those years. 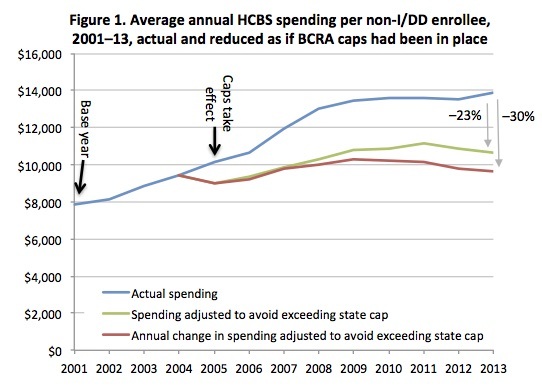 Findings indicate that caps would likely have caused the vast majority of states to limit HCBS growth, reducing increases in per-enrollee spending to substantially below the increases that actually occurred. By 2013, HCBS spending for people with physical disabilities, seniors, and other non-developmental disabilities would probably have been reduced by between 23% and 30% below actual spending. For programs targeted to people with intellectual or developmental disabilities, reductions of up to 14% would have occurred. Updated 7/14/2017 for the second BCRA discussion draft.